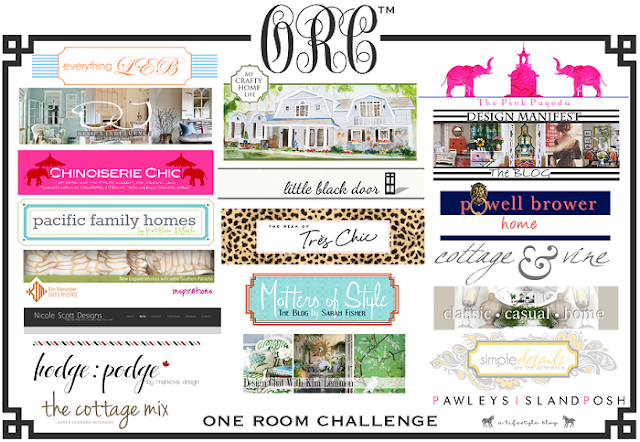 The One Room Challenge is now in the home stretch. All 20 of us bloggers/designers are kicking it up into high gear to get our rooms done for the final reveal on March 20! Ahh... the tension, the nail biting, the hair pulling and the anxiety is starting to be felt. You can start at the beginning of my adventure here. My report cards are in, the pressure is off and it is only 2 weeks until spring break! We get 2 weeks off this year. This gal plans on kicking up her heels and just relaxing. I am feeling pretty pumped about my room's progress. Even though no renovations are happening in the space and not much has been purchased, I am enjoying shopping the house. 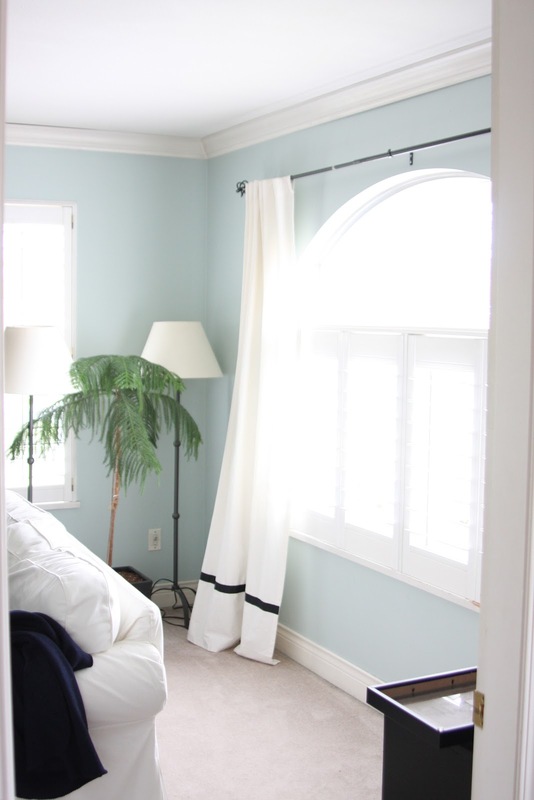 This week the drapes that were in the space got a quick and easy makeover. The drapes are my favourite Ritva drapes from Ikea. With several meters of ball fringe, they are looking mighty fine, don't you think? This cozy sheepskin made it's way into the space. It comes from Not On The High Street, a unique online gift shop that hails from the UK. I had a hard time choosing what I wanted. Their shop is full of unique handcrafted items, kind of like Etsy! This sheepskin rug was the perfect addition to adding that extra layer of texture and warmth to the space. After placing my order it arrived on my doorstep within a week! My kids keep taking it, laying on it and sleeping with it. I just hope the dog doesn't decide to attack it. Fingers crossed! Doesn't it look all pretty like hanging on the sofa? Since my house is full of fabulous artwork created by my children, particularly made by my middle child. Why not display it for all to appreciate? This piece was inspired by our trip down the California coast two summers ago. The Big Sur was especially breathtaking. Lastly, I am thrilled that Panyl has their new pattern line up and running. 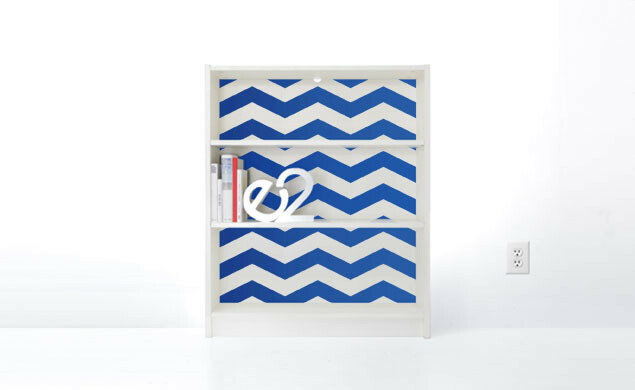 I have been working closely with the co-founders and designers (Dan and Tristam) of Panyl products to create a custom background using their new product to line the back of my Billy bookcases. I can't WAIT to have them in my hands and up! It will be fabulous. You will have to come back to see the colour and pattern I chose! Re-vamp my Coke bottle tray. Be sure to pop by and see if the other 19 gals have made any progress! I've been waiting for just the right project to add some pom pom trim. This looks so cute! Love the pom pom trim. So cute. 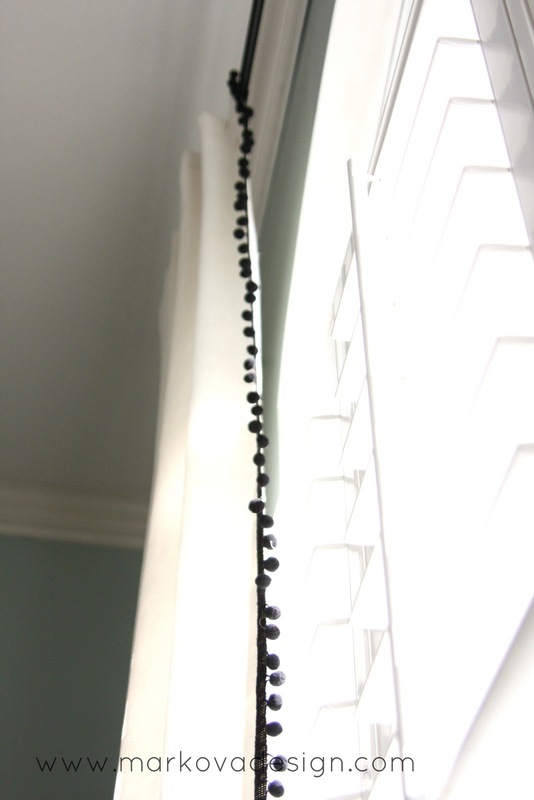 Yep, I'm on the pom pom bandwagon too - just love how it makes inexpensive drapes look so designerish! Great job Barbara! The drapes look so cute! I like how the room is coming together. The drapes are fantastic! 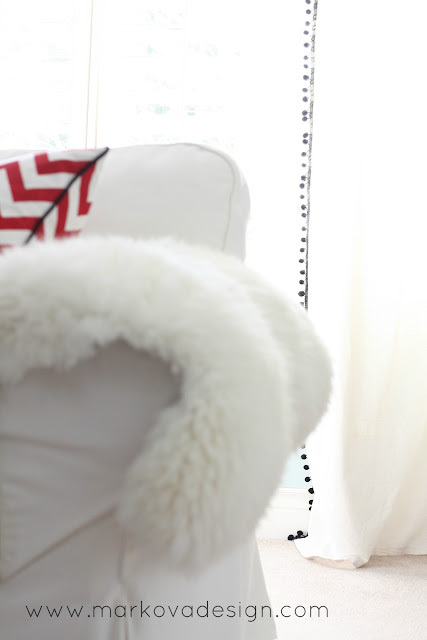 I love the addition of the pom pom trim! I want that sheepskin. It needs to watch TV with me every night. they truly do look mighty fine! fabulous job, Barbara!!! The trim totally makes those drapes- LOVE them! The perfect playful detail - so pretty, Barbara! It sure is coming together nicely! 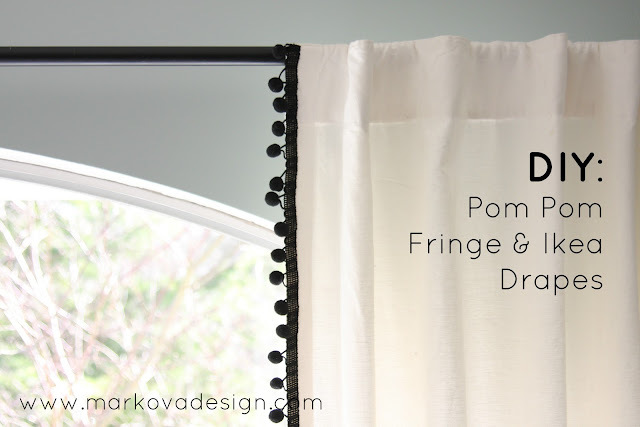 The pom pom fringe is adorable! How lucky you are to have an artist in the family! The ball fringe added the perfect touch. Panyl contacted me a while back with an offer. Wish I had taken them up on it now :(. This really makes me want a sheepskin. Love the fringe...perfect custom touch! The pop pom's are fantastic. 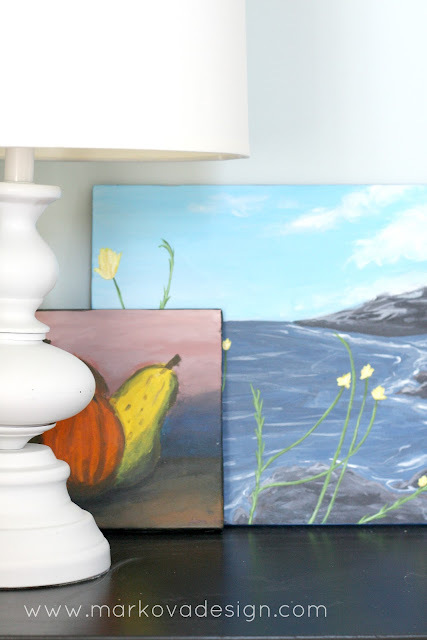 I love all of the original art in your home. How special that it was done by the middle one. I am dying to see your Panyl makeover. I love that pom pom trim Barb! I have sheepskins all over my house, I love them so much. I can't wait to see the PANYL..good luck! Looking good Barb! The drapes are super cute. I can't believe your daughter drew that piece. So pretty. Yes! The curtains look great and I didn't know you had other artists in the family! The room is really coming together. 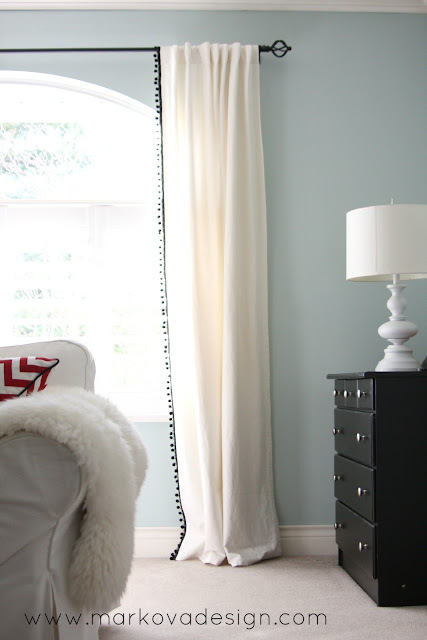 Everything looks so fresh in white & pale blue with a grounding of black (sweet pom poms!)... and the scatterings of your favourite red and go-to patterns, along with your kids' art (love!). You're creating a distinctly Marcova Design room!! Looking good Barbara! I really like the sheepskin - it looks so cozy. I am so excited for you! Love a leading edge on a drape! Thanks for inspiring! so much fun! 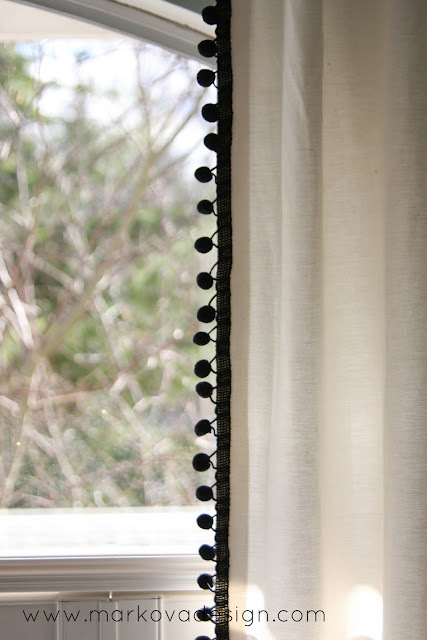 I love those drapes ... maybe I need to do something just like that this year!